2016 I. Brand & Family Winery, Cabernet Franc, Bayly Ranch Vineyard, Paicines AVA, San Benito County. Ian Brand’s gorgeous and freshly focused 2016 Bayly Ranch Cab Franc is heavenly in the glass with easy tannins and fine delicacy and detail, it’s a more Loire style version with minimal oak presence and mineral charms. Brand and team sourced these grapes from a south facing sloped parcel in the Paicines zone near the Tres Pinos Creek and the San Andreas Fault. The soils here consist of a stony mix including ancient alluvial deposits with an array of geologic structures in this the fault area. Ian picks this site at moderate sugar levels to allow freshness and balance, and he vinified whole berry, with selected yeasts in this vintage, with a cool 18 day maceration, then this Cabernet Franc was raised for just under a year neutral (well seasoned) French oak. While the 2015 was denser and earthier with a intense Chinon like presence, this 2016 is a tough lighter in weight, but more expressively pretty in the glass with stunning varietal purity and lovely length and a vivid red fruited personality, it’s lacy and refined, while still full of purpose and depth of flavor. The Paicines AVA is located in San Benito County, It is part of the larger San Benito AVA, and is located near the central part of the county, it’s warm region, but with cool nights, perfect for Cabernet Franc, and made that much more interesting because of the unique subsoils and rocky terroir here, it’s been been well known for years as a secret spot for high quality grapes, with Williams Selyem sourcing their central coast Pinot from the Vista Verde Vineyard, as well as having spots with Arneis, Cabernet Sauvignon, Chardonnay, Malbec, Merlot, Petit Verdot, Syrah as well as Bayly Ranch’s Cabernet Franc. 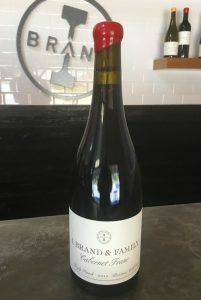 Ian, being the vineyard whisperer he is has found a gem here, and his 2016 revels in layers of blackberry, plum and cherry fruits along with minty herb, subtle red bell pepper, dusty spices and tangy dark currants all in a graceful form that is dynamic and vibrant. Filling out with air and adding a hint of leather, cedar, warm chalk and floral tones this single vineyard Brand Family Franc is an absolute joyous old world inspired red that delivers on it’s promise, it great juice, especially for the Loire style enthusiast, I am excited to see where this beauty goes, I have high expectations for a rewarding cellar sweet spot for this one, I think it’s potential is awesome, I look forward to a 5 to 10 year sweet spot. I put away some of both 2015 and 2016 to see which impresses most over time, but this 2016 is drinking so well it will be hard to keep my hands off it! Ian Brand’s signature set of wines are outstanding, don’t miss this new one, as well as his wonderfully mineral driven 2016 Escolle Vineyard Chard, which are just released, but don’t forget his Santa Cruz Mountains Cabernet Sauvignon Monte Bello Road, the Bates Ranch Cabernet Franc and Ian’s Enz Vineyard Mourvèdre!